The Ancient Egyptians believed that after a person died, his soul could live on and enter a second, better life - but only if he had not committed any sins during his first life. To check whether he had lived a good life, a person's soul had to be questioned, in the presence of a nightmarish monster....! The pharaoh, ruler of all Egypt, had died, and now his soul was in the Underworld, awaiting his fate in the Hall of Judgement. Before him stood Anubis, Egypt’s jackal-headed god of death, and at the god's feet sat a truly terrifying female monster. Known as Ammut, she was so frightening that no-one dared to look at her. 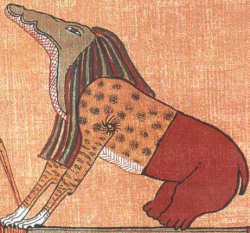 If the pharaoh’s soul had been brave enough to do so, however, he would have seen that she had the head of a ferocious crocodile with huge jaws, and that the front half of her body was that of a lion, whereas the back half was that of a hippopotamus. Ammut was there for one very specific, horrific reason, which involved the large pair of weighing scales held by Anubis. Waiting to be placed on one pan of these scales was a single very special feather, the Feather of Truth. And waiting to be placed on the second pan was the pharaoh's own heart. If his heart weighed less than the feather, this meant that the pharaoh had been a good man while alive, and his soul would live on. But if his heart weighed more than the feather, this meant that he had been an evil man - and his heart would be taken off the scales, then thrown to Ammut to be eaten by her! And once a person's heart had been eaten, his soul could not be reborn. Anubis began questioning the soul of the pharaoh, asking him if he had committed any sins, and the pharaoh’s soul said that he had not. When the questioning was over, silence filled the Hall of Judgement as Anubis took the Feather of Truth and the pharaoh's heart and placed them on the scales. Ammut raised her head and opened her massive jaws, filled with razor-sharp teeth, waiting for the verdict - and also, she hoped, the pharaoh's heart. It had been a day of abject failure for the king's hunting party. Hour after hour of diligent pursuit through the royal forests had been rewarded with nothing more than an occasional glimpse of a fleeting silver-shod hoof, or the momentary glitter of a sparkling horn, amid the shadowy dells and woody trails. Yet their leader was far from despondent, for he knew that they had been purposefully directing their quarry's flight towards a secret location at the very heart of the forest where the monarch himself had placed a sublime snare from which no unicorn could possibly escape. Far ahead of the hunting party, the unicorn strolled nonchalantly, well aware of their presence, but equally certain of his ability to elude them with effortless ease. Here, alone in his woodland realm, at peace with nature, he shimmered and shone as if bathed in the pallid luminescence of living moonlight, and his long spiralled horn glittered and glistered with starlit brilliance. Even his long silky mane rippled with lustrous beams of light as the cool forest wind caressed its flowing tresses, and his slender but powerful hooves gleamed but made no sound as he trotted across stones and twigs strewn across the ground. Soon he would take flight again, leaving his pursuers far behind to seek him vainly once more, just as he had done so many times before. But then, abruptly, he sensed something - something profoundly mysterious and beguiling, but truly wonderful. In all his years in this place, he had never sensed anything like it before. Yet without even understanding why, he instantly felt compelled to seek it out. The unicorn moved swiftly between the trees, drawn inexorably by something intangible and unrecognised - yet which seemed to sear his eyes with strange but magnificent visions, to assail his ears with heavenly refrains as if sung by a celestial choir, and to fill his flaring nostrils with a glorious scent that intoxicated him completely, suffusing his very being with heady delight, until he felt as if he were soaring instead of merely galloping. Onwards he raced, until he came to a sunlit glade, sited in the deepest region of the forest. All around was darkness and gloom, but the glade itself was richly illuminated from above by a golden panoply of sunlight. And here, seated demurely on the soft grass amid a multicoloured dappling of flowers, was a youthful maiden - her long flaxen hair falling down about her like waves of burnished gold, and her crimson dress swirling over the grass in deep folds. The unicorn stood at the edge of the glade, mesmerised by the sight of this fair damsel. Never before had he seen anything so beautiful, so wonderful. Even the most fragrant of blooms, the most magnificent of jewels, and the most brilliant of rainbows seemed wan and lifeless to him now, compared with her radiant beauty and grace. He moved forward slowly, head slightly bowed, and the maiden raised hers to look at him. Their eyes met - hers as blue as a robin's egg, his as deep as the oceans - and his heart was filled with a tranquillity and love that he had never experienced until now. Here was the most perfect human that any unicorn could ever hope to encounter and one that no unicorn could ever resist - a virginal maiden, untouched, immaculate. This was the daughter of the king himself - who knew that the very presence of the princess would be enough to entice the unicorn here, where his men could then surround it. There would be no escape. The unicorn, however, suspected none of this. He knew only that he had found what he had unconsciously been seeking all his life - the embodiment of love, truth, and happiness. 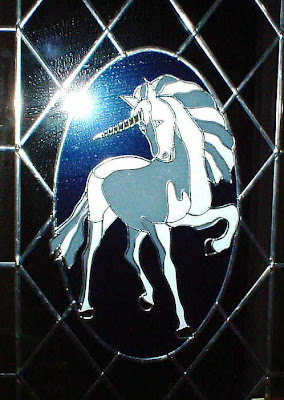 He knelt before the princess, and placed his noble head upon her lap, and as she gently stroked his rippling mane she ran a slim, silken-gloved finger along his ornately whorled horn, gazing at the unicorn before her in wonder, knowing that few humans had ever been granted so intimate an encounter with this most mystical and marvellous of creatures. 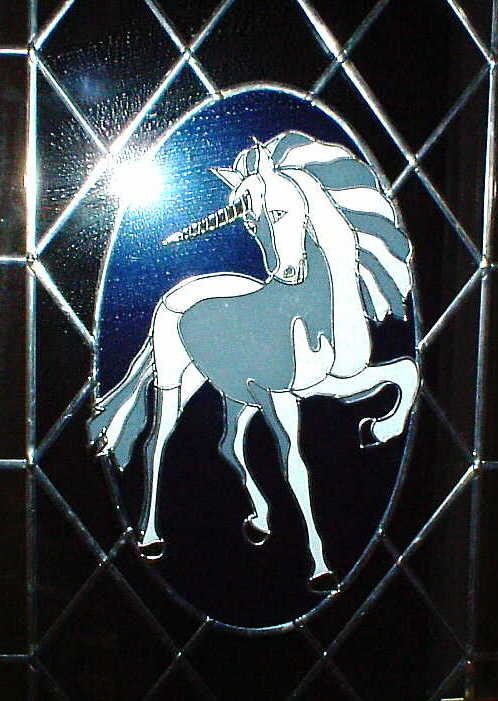 The unicorn closed his eyes in rapt acquiescence, at perfect peace, having found at last his heart's desire. And so he never saw the hunters stealthily emerge from the bushes at the edge of the glade and move swiftly towards him on all sides. Nor did he see the leader of the hunting party raise his spear-bearing arm in readiness to strike the fatal blow, or a second hunter who stepped forward alongside his leader, bearing a heavy, sharp-bladed axe with which the unicorn's precious horn would be hacked from his brow. And he did not see, nor even suspect the presence of, the sorrowful tears that fell silently from the eyes of the princess as she gazed down for the last time upon that gentle, trusting creature whose head still lay nestled in her lap. The spear pierced, the axe fell, the deed was done. The scarlet blood that flowed from the breast of the dead unicorn mingled with the crimson dye of the princess's dress, and his horn, now dull and crudely severed at its base, was borne aloft triumphantly by the leader of the hunt. At that same moment, a rider seated upon an ebony-hued steed appeared, dismounted, and walked towards the group. It was the king. The huntsmen immediately knelt, but he bade them leave and take the unicorn horn with them. He then turned to his daughter, smiling, and offered her a pouch of golden brocade, filled to the brim with dozens of bright silver coins - her reward for having agreed to be the lure to snare the unicorn. But the princess shook her head. "No, my father," she said. "There is too much here - thirty pieces of silver is all that I deserve for what I have just done". Then she walked away, leaving her father the king holding the pouch of silver in his hand, and the dead, hornless unicorn lying cold and still upon the grass. Does anyone out there in Britain have a Canon Starwriter 80, 70, or 300 model of word-processor that is no longer wanted and would be free to a good home? Namely, mine. After many years of faithful service, my dear old Starwriter 80 recently went to that great word-processing office in the sky, and left behind all its worldly goods with me, which consist of around 100 floppy discs containing articles and book manuscripts of mine that are not PC-compatible, but which I now urgently need to access. I'm discovering that a fully-working Starwriter is as rare and elusive as any cryptid, so if there is indeed any good soul out there willing to donate theirs to me (must be an 80, 70, or 300 model, nothing else), I would be exceedingly grateful. Moreover, in exchange for your covering the p&p, I'd be more than happy to send you a personally-inscribed copy of my Dr Shuker's Casebook, or the rare British edition of From Flying Toads To Snakes With Wings. Please email me at karlshuker@aol.com as usual if you can help - thanks immensely! As illustrated in the above engraving of this incident, on 24 September 1877 a monstrous multi-limbed sea beast was washed up, still alive, onto Catalina beach in Newfoundland's Trinity Bay. Each of its two great eyes was 8 in across, its body was 9.5 ft in length, and a thrashing mass of tentacles, ten in total and measuring up to 11 ft long, sprouted from its head in dramatic duplication of the legendary hydra. 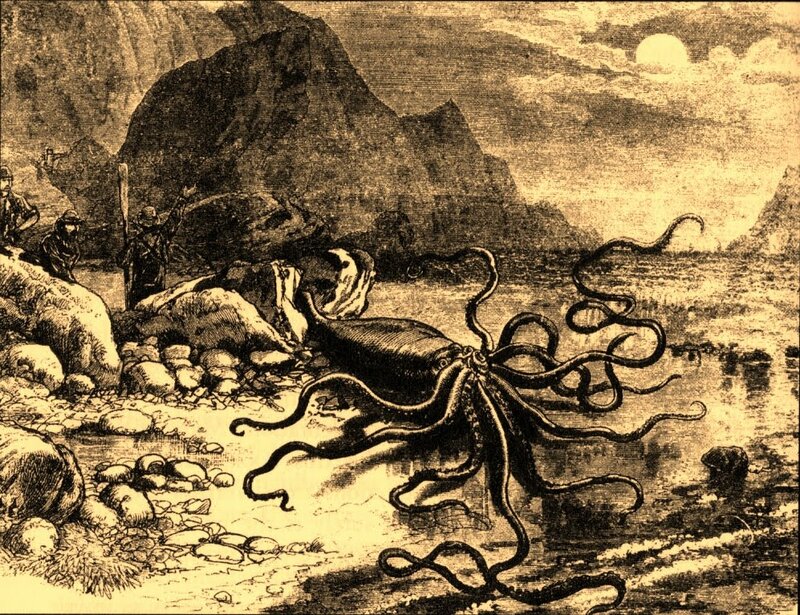 Inevitably, it was dubbed a devil-fish, like many similar sea monsters washed ashore here and elsewhere during that same period, but today we can readily recognise it as a giant squid. Down through the ages, the term 'devil-fish' has been applied to a wide selection of very different animals. These range from octopuses and whales to a diverse array of fishes, but also include certain examples, like the Trinity Bay sea monster, relevant to cryptozoology. Over the years, I have received a number of communications from puzzled correspondents who have encountered in various curio shops and sideshows around the world dried specimens of an exceedingly bizarre-looking monstrosity frequently referred to by its owner as a devil-fish. Almost invariably it resembles the specimen depicted above (from my own collection), with a tall pointed head, large eyes, leering mouth, a pair of long legs, showy wings, and a slender, curling tail. Faced with such a weird apparition, it is little wonder that they have wondered whether it might be some hitherto unknown species, dredged from the depths and still awaiting formal scientific recognition. Sadly, however, the truth is much more prosaic, albeit memorable. This type of devil-fish is, in fact, a modern-day equivalent of a famous zoological hoax perpetuated down through history by generations of astute fishermen eager to coax money from gullible travellers and seekers of curios. Known as a jenny haniver, and sometimes even assuming the exotic guise of a small winged dragon or basilisk-like beast (depending upon the skill of its fisherman creator), it is actually a deftly-modified skate or ray. Dried in a manner that presents its undersurface to the observer, its broad pectoral fins have been cunningly sliced to resemble wings and legs, with its respiratory spiracles moulded into realistic 'eyes' (its genuine eyes are less conspicuous and sited dorsally, not ventrally). 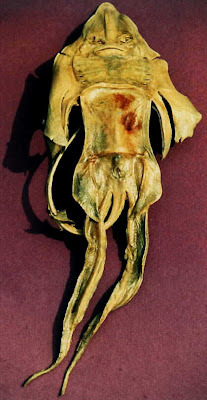 Indeed, keeping abreast of modern trends, some enterprising Mexican sellers are actually passing off dried devil-fish specimens to unsuspecting tourists as the remains of crashed extraterrestrials! Another devil-fish with cryptozoological connections is the Atlantic giant manta ray Manta birostris, also known evocatively as the great devil-fish, devil ray, or vampire ray. Despite being the world's largest species of ray - indeed, one of the world's largest fishes of any kind - the manta's existence was not formally recognised by science until 1829. However, records of fishermen's tales describing this immense fish considerably precede that date. 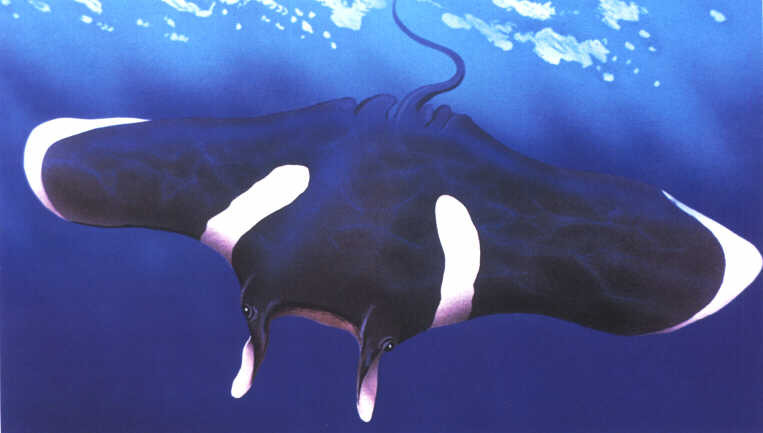 Weighing up to 3500 lb (if not more) and measuring up to 20 ft long, the giant manta is instantly identifiable by virtue of its vast wing-like pectoral fins, black above and white below, and known to span up to at least 22 ft across. Equally noticeable is its lengthy tail, as well as its broad mouth - stretching across the front of its head and yielding at each corner a forward-projecting 'horn' comprising a portion of the pectoral fins. Coupled with its unnerving tendency to leap abruptly high out of the water like some demonic bat-monster released from the oceanic abyss, it is little wonder that the manta, in reality a harmless surface-swimming plankton feeder, has inspired many lurid but erroneous tales of horror. Among the most popular, but entirely preposterous, of these is that the manta will wrap its massive pectoral fins around skin divers or other unfortunate human swimmers, and duly devour them. Notwithstanding such bizarre yarns, however, there are also some genuine cryptozoological mysteries concerning this huge fish still in need of a satisfactory solution. First and foremost: just how large do mantas grow? As specimens are very rarely captured, and those that have been are seldom examined thoroughly due to their great size or because they have been accidentally discovered washed up on some remote beach lacking facilities for easy examination or transport elsewhere, ichthyologists are still unable to estimate with conviction the likely upper size limit of this spectacular species. Every so often, divers have reported encountering colossal mantas seemingly exceeding the known record, but there is little way of verifying such reports. Perhaps the most incredible record, made by French skin diver Cornel Lumière, featured a gargantuan manta reputedly spanning 60 ft across and weighing 5000 lb. If true, this would dwarf even the mighty whale shark, currently deemed to be the world's largest fish. "[It was] of somewhat the usual manta or devil-fish shape, except that the wings were not noticeably concave behind, and the lateral angles were not acute. The cephalic horn-like structures were conspicuous and more straight than incurved. In general the back was dark brown, faintly mottled, while the most conspicuous character was a pair of broad, pure white bands extending halfway down the back from each side of the head. The wing tips also shaded abruptly into pure white." 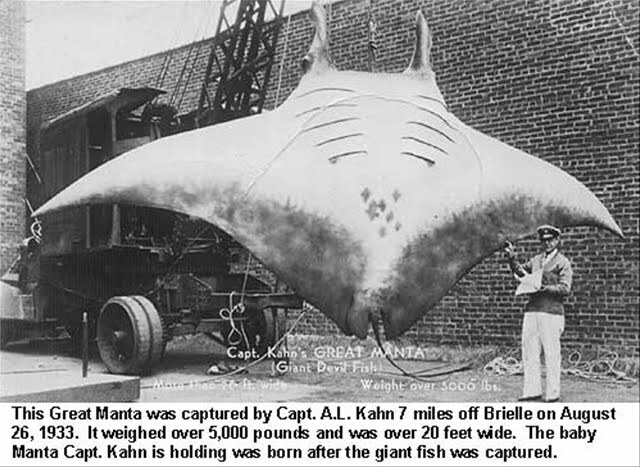 More than 70 years later, Beebe's white-banded manta ray remains uncaptured and undescribed in the formal zoological literature, even though a number of similar, equally puzzling specimens have been reported widely in seas across the globe - confirming that even today the seas still harbour many extraordinary cryptozoological denizens eluding official recognition. AT THE SIGN OF THE CAT - FELINE SYMBOLISM, DREAMLORE, AND FOLK-BELIEFS. As my previous blog, surveying dog symbolism in dreams, attracted so much interest, here's a feline counterpart, examining cat symbolism, and not just in dreams this time. The feline image - sleek, silent, shadow-like, the embodiment of sphinx-like inscrutability - is unquestionably one of the most potent, diverse, and mystical of all animal symbols. There have been dark periods during its long affiliation with humanity, as in Europe during the Middle Ages, when the cat was denounced as a creature of evil, in league with witches and demons. Equally, however, as will be seen here, it has also inspired many much more positive, benevolent associations - everything from moon guardian to marriage blesser. 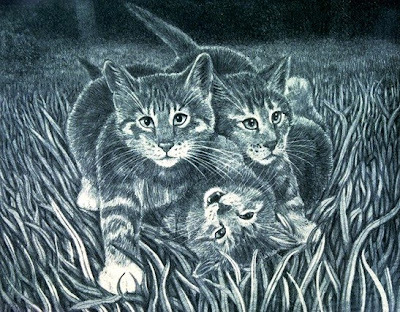 The cat's lunar links date back at least as far as the ancient Egyptians, who likened the changing dilation and contraction of the pupils in its glowing eyes to the waxing and waning of the pallid moon, and its nocturnal activity to the moon's night-time visitations. Indeed, according to Egyptian mythology, the cat owes its eyes' shimmering phosphorescence to the sun-god Ra, who entrusted to it the sun's brilliant lustre, to be guarded and diligently transported by it throughout the night - so that our planet would never be entirely without light, and as a promise that the sun would itself return every morning. As an emblem of the moon, which is traditionally portrayed in many mythologies worldwide as feminine in comparison with the masculine sun, it was inevitable that the cat too would become a symbol of femininity and associated with a number of important female deities. Most familiar of these is Bast, Egypt's golden-eyed cat-headed goddess of the moon (again) and fertility, via whom the cat has also become linked symbolically to childbirth. Indeed, 'Ru', which is the Egyptian hieroglyph representing birth, was based upon the shape of a cat's eye, and when placed upon the Tau cross, representing time, yielded the famous ankh - symbol of life and immortality. This later became synonymous with Venus, the Roman goddess of love, thereby reinforcing the cat's link with femininity and fertility. Similarly, Venus's Norse counterpart, the goddess Freya, not only symbolising love and passion but also ruling the dark, mysterious kingdom of the night, rode through the sky in a chariot drawn by a team of cats (originally lynxes). And in Hindu mythology, Shasti, goddess of childbirth, is borne aloft not upon a horse or elephant, but upon a cat instead. The cat's nocturnal lifestyle readily lends itself to deep, metaphysical feline symbolism. As revealed in Tom Chetwynd's Dictionary of Sacred Myth (1986), because the cat can see in the dark and is thus active at night, it has become a symbol of intuition, capable of navigating through the shadowy realm of the unconscious and seeing into the darkness of the future. Notwithstanding this, the cat has failed to receive a very good press from those who specialise in dream divining. To dream about a cat is traditionally claimed to denote bad luck, unless you can chase it away before waking, whereupon you will successfully overcome sizeable obstacles and acquire great fame and fortune. Similarly, to dream of hearing a cat mewing or screaming is supposed to indicate that you have a false friend who will utilise lies and misleading words to create problems for you. As before, these odd ideas have no doubt been inspired by the cat's secretive, enigmatic nature and liking for night-time prowling. In addition to the cat's personification of intuition, its lunar associations are not lost upon Chetwynd either. He notes that cats can be white or black, "...like the full and dark moon and so depict the extreme opposites of life and death, nourishing milk and dark poison. But they also come striped and so are the pattern of the transformations of the moon which governs the alternating rhythm of the tides, and so the whole great movement of life". The cat's symbolic ambivalence is very apparent within Eastern cultures. For instance, both in China and Japan the cat was traditionally looked upon as a cunning shape-shifter, capable of transforming itself into many different guises. In China, however, it reputedly underwent these transformations for evil purposes, and was a symbol of yin (thereby allied yet again with femininity), whereas in Japan its transformations were beneficial. Moreover, Japanese sailors actively welcomed cats on account of their supposed ability to ward off dangerous maritime demons. Similarly, whereas in Zoroastrianism the cat serves the evil deity Ahriman, in Islam it is cherished by Muslims because it was blessed by Mohammed. Perhaps the most familiar example of contrasting double images in the West concerns black cats and white cats. Once the superstition-ridden age linking cats and witchcraft had vanished in Britain, the black cat became associated with good luck, especially if one of these sable-coated felids should cross your path - whereupon you should make a wish and hope for it to come true. White cats, conversely, were looked upon as weird, unearthly creatures. Yet in the U.S.A., as well as in certain continental European countries, such as Spain and Belgium, the reverse situation has prevailed. Here, a black cat still symbolises darkness and is viewed somewhat uncomfortably by the more superstitious-minded, whereas a white cat symbolises light and is welcomed as a sign of impending good fortune - so too are grey cats. Just to be different, in Russia lucky cats are neither black nor white, but blue. And in East Yorkshire, although it is lucky to own a black cat, it is unlucky to meet one. The cat features extensively in superstition and folk-beliefs. For instance, if a cat should sneeze once, good luck will visit its owners - or the weather will become rainy! If it should sneeze three times, however, its owners will all develop colds (rather like the cat, one would imagine, if it has sneezed three times in succession!). And if it should sneeze near a bride on the morning of her wedding, her marriage will be a happy one. To say the word 'cat' outloud down in a mine or on board a ship is not recommended, at least according to early superstitions, but the presence of a cat on a ship is said to bring good luck, and the ship's cat is often among the first individuals to be rescued by the crew in the event of a shipwreck. It bodes particularly well for a ship's good fortune if a cat should come aboard uninvited and decide to stay - woe betide anyone foolish enough to try to chase it off! And any sailor's wife living on the Yorkshire coast who kept a pet cat at home would feel reassured that her husband would always return safely home from the sea. 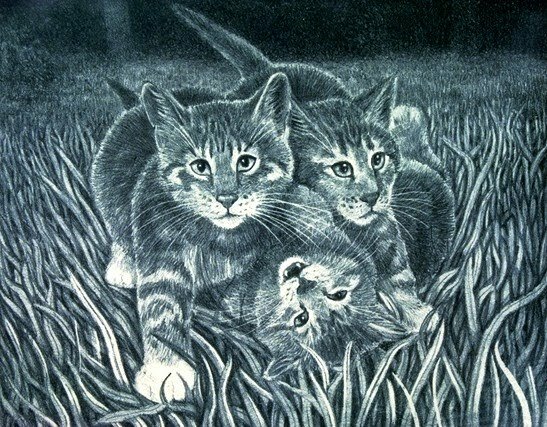 Last but not least: the reason why cats are said to have nine lives is that in ancient times, the number nine was deemed to be exceptionally lucky, because it was three times three, or a trinity of trinities. And of all animals, what could be more suited to being blessed by the gift of nine lives than that not only very tenacious but also famously lucky species, the cat? 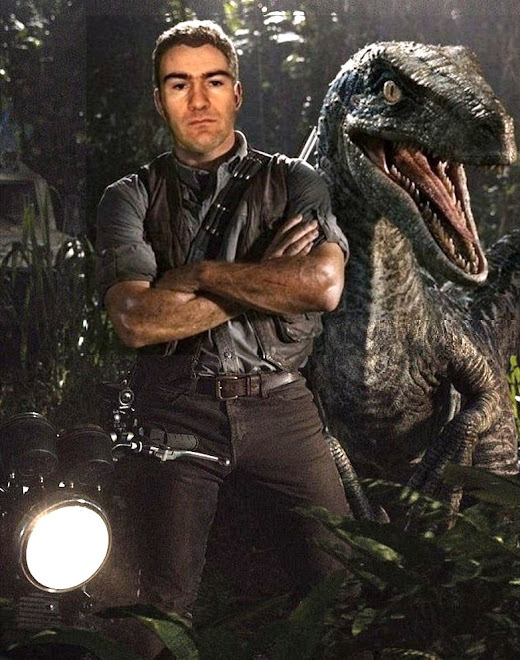 Much as I like cryptozoology, my interests in animal mysteries and anomalies are not entirely limited to that field, as many of you know - which is why my blog is entitled ShukerNature, rather than ShukerCrypto or suchlike. So here, just for a change, is a departure into animal symbolism and mysticism. DOG DREAMING: UNMASKING THE HOUNDS OF MORPHEUS. Bearing in mind that the dog was first domesticated by humanity around 9500 years ago and has famously become 'man's best friend' in the animal world, it is hardly surprising that our dreams should often contain canine incursions - or, as a scholar of classical Greek mythology may prefer to dub them, the hounds of Morpheus. But do these visitations have any symbolic significance? Could they comprise subconscious messages - even warnings, perhaps? As will be seen, according to the traditional lore and legends associated with dream divining, the answers to such questions depend upon a variety of different factors. These include the identity of the owner of the dog featured in your dream, the dog's behaviour towards you, its activities, and even its specific breed or morphological appearance. Symbolically, the dog personifies loyalty, faithfulness, friendship, and affection. Generally speaking, these traits are also personified by a dog encountered by you in a dream - provided that, in your dream, you are the dog's owner. If your dream dog is in good health, this is supposedly a reflection of your finances' healthy outlook. Similarly, if it should play with you in an affectionate manner, this indicates an impending improvement in your fortunes, and success with any romantic liaison that you may enter into in the near future. Indeed, so potent is the benevolence represented by a dream dog owned by you that even if it should disturb you by barking or snarling at you, this simply means that you will achieve success against scheming, treacherous false friends. That, at least, was the opinion of Thomas Tryon, a celebrated 17th Century dream diviner from Bilbury, Gloucestershire, and author of A Treatise of Dreams and Visions... (1695). Tryon also claimed that if your dream dog tears your clothes, this should be taken as a warning that one of your enemies is saying bad things about you or even threatening your job. If the dog in your dream is owned by someone else (particularly a stranger), however, it supposedly represents a profound enemy, and should be treated with great care. 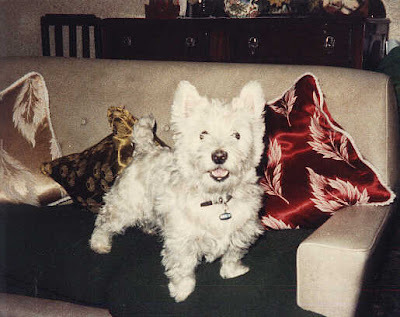 Paying close attention to the activities of a dream dog provides important clues to the nature of the message conveyed by its visitation, at least according to the lore of dream-divining. For example, a dog seen swimming implies that good fortune and happiness lie easily within your grasp; and your future undertakings will surely be successful if you dream of taking a journey alone but with a dog following closely behind you. Equally, if you should be approached in a dream by a friendly dog, especially a white one, success in your romantic or business life will soon come to you. Conversely, if a black dog should approach you, beware - this is not a good omen. Indeed, this interpretation probably stems from the age-old legends of phantom Black Dogs, whose appearances often presage disaster or death. Similarly, dreaming of a howling dog is said to be unlucky - no doubt derived from primitive, fanciful superstitions offering equally woeful claims regarding dogs baying mournfully at the moon. Dreaming of dogs engaged in hunting other animals, such as foxes, allegedly prophecies an unexpected increase in the speed of your future undertakings. And a dream featuring a dog killing a snake is said to symbolise good luck (for you, if not for the snake!). But if you should be bitten by a dog in your dream, then you will suffer a loss - or, at the very least, be deceived by your loved one. So make sure that you don't tease a dream dog! According to the early dream interpreters, different breeds, sizes, and types of dream dog had very different meanings - most of them notably moralistic. For instance, a pursuing bloodhound should be taken as a warning that you are about to face a great temptation, which, if succumbed to, could cause great problems for you. Moreover, if you should be startled by the sudden appearance of a sizeable mastiff, this symbolises a considerable inconvenience that you will experience if attempting to better yourself in the future. Nor should you feel comforted by a seemingly innocuous, pleasing dream featuring one or more fancy pet dogs, because such a dream would expose you as a vain, selfish exhibitionist, overly fond of ostentation. And dreaming of small dogs is supposedly a reflection of inherent small-mindedness and frivolity! Chihuahuas, take note! Not surprisingly, the appearance of a mad, rabid dog in a dream traditionally represents a failure to succeed (as does an unkempt or emaciated dog), and even the impending onset of some dire illness. But who would have guessed that a many-headed Cerberus-lookalike personifies your frustrated attempts to achieve too many goals at once? A WOLF IN DREAM'S CLOTHING? As a rule, the domestic dog's wild relations do not fare very well at the hands of the dream diviner. Should you ever dream of encountering a wolf, for instance, this dream is reputedly warning you that one of your business associates not only is a thief, but also is someone who cannot be trusted with secrets, as he or she will betray you if the opportunity presents itself. If you dream of hearing a wolf howl, this indicates that there is a secret alliance of rivals seeking to overcome you, albeit honestly, in future business deals. As may be anticipated, dream foxes epitomise slyness, but also envy and betrayal by your working associates. And if you chase a fox in your dream, this is traditionally interpreted as a prediction that you are about to pursue a risky professional or romantic course of action. Even a tame, friendly fox should not be trusted in a dream, or so they say. So when you next dream about a dog, remember that it may portend some highly significant event in your future. Alternatively, of course, it may simply mean that you like dogs!